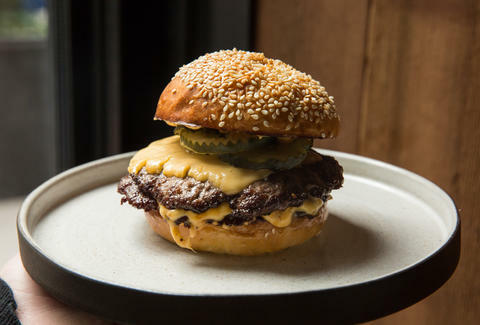 April Bloomfield is known for not letting anyone mess with her burger (the famed chargrilled burger with Roquefort at the Spotted Pig, that is). Which is why it came as a surprise -- however pleasant -- that she and business partner Ken Friedman would open a fast-casual burger joint with three different burgers on the menu (in addition to a house-smoked hot dog, a crispy fish sandwich, jalapeño fritters, fries, and salads). Salvation Burger -- which expands upon the team's Salvation brand that includes Salvation Taco -- is now open in the Pod 51 Hotel, and we stopped in to try it out. 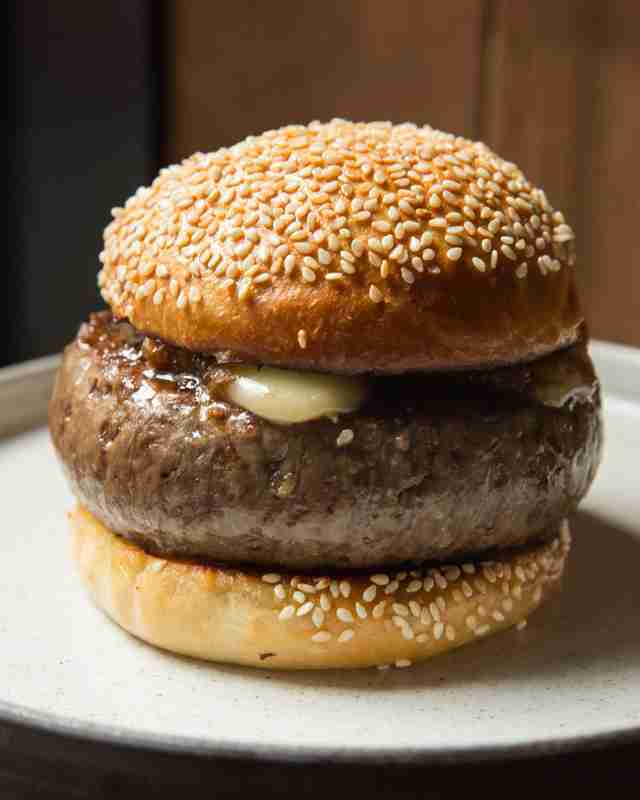 Both of Bloomfield's beef burgers (there's also a veggie burger on the menu) use grass-feed beef butchered in-house. The Salvation Burger, which is the fancier (and, at $25, pricer) of the two, features a fairly rare patty that slightly resembles that of the Spotted Pig burger (though that's about the only similarity) and comes topped with taleggio and caramelized onions. It's tasty, but heavy on salt and could use more cheese and onions. The classic, cheaper (at $17) burger is the real standout, proving Bloomfield still does best by keeping things simple. 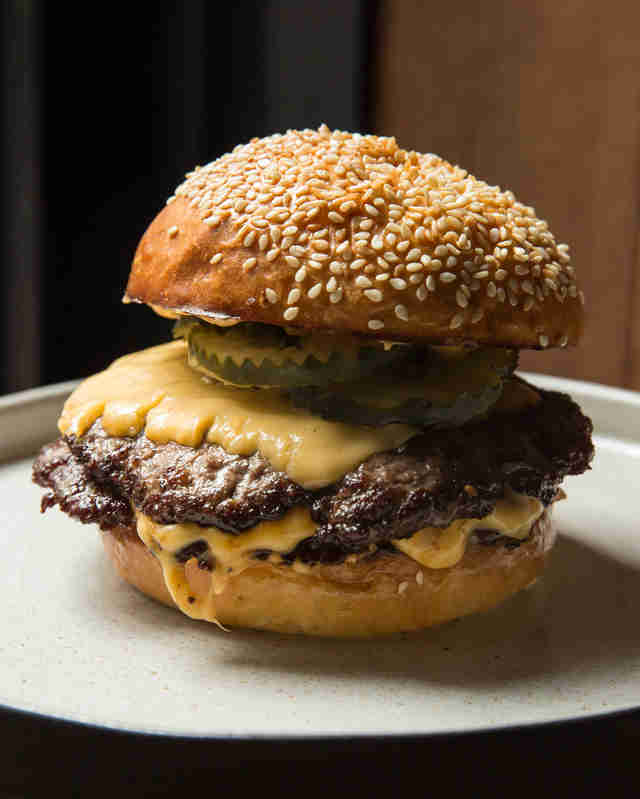 The fast food-inspired burger comes with two thin patties, pickles, what's been touted as a "house-made 'processed' cheese" that tastes like cheddar, and "special sauce" (a Thousand Island variant). It's greasy and cheesy in a way that resembles Bloomfield's beloved Five Guys. 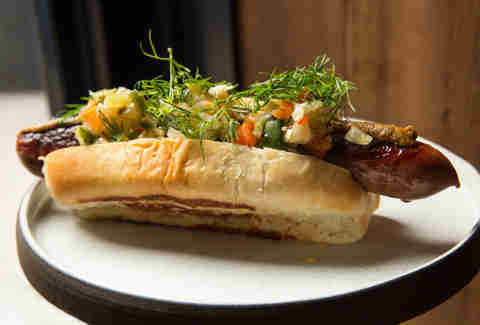 Bloomfield's large house-smoked hot dog, topped with giardiniera and house-made mustard, also fits right in with the casual restaurant theme. It's not overcomplicated, and the smoky flavor and slightly spicy kick from the giardiniera work plenty well on their own. While most fast food hot dogs are thin and ultimately unsatisfying, the dog at Salvation burger could be a meal in itself. Lucy Meilus is Thrillist's New York Editor. Follow her on Twitter and Instagram.